Badgingarra is 215km north of Perth. There’s a footy ground but the town does not have a team. I’ve don’t know of any prominent players who have hailed from Badgingarra and the town doesn’t even rate a mention in A Way of Life: the story of country football in Western Australia. It’s a pity because the town oval has a very nice scoreboard. 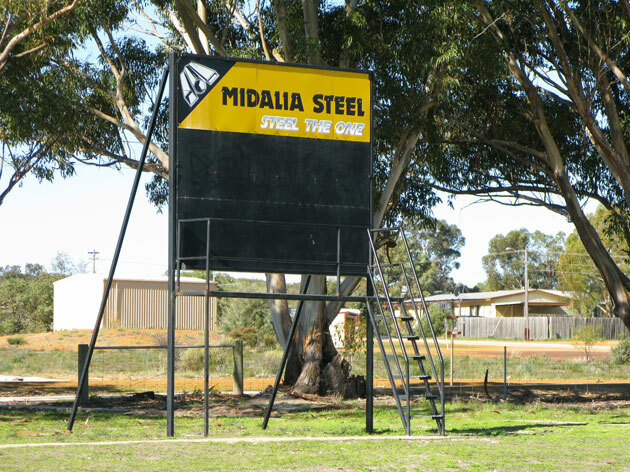 Badgingarra isn’t completely bereft of footy – the Central Midlands Coastal Football League holds committee meetings there – maybe because of its central location. We’d love to hear from anyone who can tell us about footy in Badgingarra. I haven’t come across a reference to football there. Nearby towns Cervantes, Dandaragan, Jurien Bay and Moora all field teams, whilst Eneabba (1991) and Leeman (about 10 years ago) no longer support a side. So that scoreboard remains a mystery. We’ve been to Cervantes, Jurien and Leeman. This year we’ll take the scoreboardpressure.com bus to Dandargan and Moora.